Welcome to The Community Guide! Let us know what you think of the website by completing this quick survey. 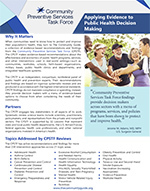 The Community Guide fact sheet outlines the work of the Community Preventive Services Task Force, noting the range of topics addressed and how recommendations can be used to improve community health and safety. 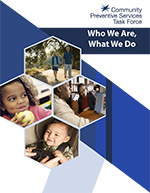 This report describes The Community Guide and the work of the Community Preventive Services Task Force, including how they engage partners, select topics, prioritize intervention approaches, conduct systematic reviews, make decisions about findings, and disseminate information about what works to promote health. A printer-friendly version is also available. 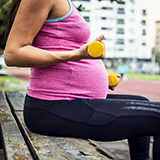 This one page handout summarizes the Community Preventive Services Task Force (CPSTF) recommendation and systematic review evidence for lifestyle interventions delivered during the first two trimesters of pregnancy to reduce the risk of gestational diabetes. This one page handout summarizes the Community Preventive Services Task Force (CPSTF) finding of insufficient evidence for three school-based intervention approaches that combine dietary interventions with physical activity interventions. This does NOT mean the intervention approaches are ineffective; it means there is not enough evidence available to understand which of these approaches work. This one page handout summarizes the Community Preventive Services Task Force (CPSTF) recommendation and systematic review evidence for school-based interventions that combine meal or fruit and vegetable snack interventions with physical activity interventions to improve health among elementary school students through grade six. This one page handout summarizes the Community Preventive Services Task Force (CPSTF) recommendation and systematic review evidence for interventions to increase active travel to school based on evidence they increase walking among students and reduce risks for traffic-related injury. This one page handout summarizes the Community Preventive Services Task Force (CPSTF) recommendation and systematic review evidence for behavioral interventions to reduce recreational sedentary screen time among children aged 13 years and younger. This one page handout summarizes the Community Preventive Services Task Force (CPSTF) recommendation and systematic review evidence for built environment strategies that combine one or more interventions to improve pedestrian or bicycle transportation systems with one or more land use and environmental design interventions to increase physical activity. This one page handout summarizes the Community Preventive Services Task Force (CPSTF) recommendation and systematic review evidence for clinical decision-support systems (CDSS) to improve screening for cardiovascular disease risk factors and practices for related preventive care services, clinical tests, and treatments. 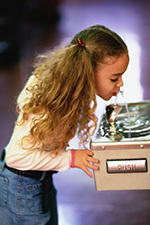 This one page handout summarizes the Community Preventive Services Task Force (CPSTF) recommendation and systematic review evidence for community water fluoridation to reduce tooth decay (i.e., dental caries or cavities). Disclaimer: The findings and conclusions on this page are those of the Community Preventive Services Task Force and do not necessarily represent those of CDC. Task force evidence-based recommendations are not mandates for compliance or spending. Instead, they provide information and options for decision makers and stakeholders to consider when determining which programs, services, and policies best meet the needs, preferences, available resources, and constraints of their constituents.